Mia Bühler is a blogger who recently became a mother. With a new addition to the family, would the Porsche Macan GTS be the right car? Here, she shares her experience. More powerful, more radiant, faster, bigger… These days, everything is “more, more, more”. It’s all about superlatives and spectacular achievements. How nice it is that our newest family member shows us what really matters on a daily basis – and it is quite a contrast to these values. It’s about a comfortable place to sit, a pleasant temperature and a good view. It’s about entertainment and, of course, that everything happens at just the right time. And not just when nappies need changing or the baby needs his bottle, but also when you need to go somewhere or work through the daily to-do list. Fortunately, our son Neon is an excellent passenger. When he was barely three months old, he experienced his first road trip in the Porsche 911 Carrera 4S. It was a little too cramped for me, but it was bearable for this one trip. The boys had a great time nonetheless. I loved the sound and the driving sensation, despite what we might call the slightly crowded seating arrangement when three people are in a Carrera. What we needed was something a little more family-friendly. No sooner said than done: Daddy Thies arrived home in a Porsche Macan GTS. Once we attached the ISOFIX base for the baby seat, we were ready to go. So the plan was for our young family to spend a few days with the 360-hp SUV (Fuel consumption combined 9.2 – 8.8 l/100 km; CO2-emissions 215 – 207 g/km) as we went about our daily lives. Sounds good, right? I thought so too when Thies revved the engine. Deep bass notes rumbled from the four black tailpipes of the Porsche Macan GTS. Boys will be boys. Now the entire neighbourhood knows about our new car too. So we set off to go shopping, followed by our daily walk. What’s that I notice? I’m really comfortable in the sporty seats, but that’s not all – that wonderful sound stays with you while you are driving. It’s always there, but it’s not too intrusive. It’s something even women could like. GTS stands for “Gran Turismo Sport”, and the Macan really does make a sporty impression, particularly when you consider that this mid-size family car weighs a whole 1.9 tonnes when empty. The acceleration is sporty too: Our red family friend tears from 0 to 100 km/h in just over five seconds and really makes me shriek on the bends. But for me, what’s much more important is the pleasant hum and the deliberately bumpy ride in Sport Plus mode. It goes down very well with tired, grumpy babies. Another important feature is the separate temperature adjustment for the rear seats. It means that mum and dad can enjoy the ride all cosy and warm in the front and the little one can drift off to sleep by staying cool in the back. As you would imagine, loading and unloading the Porsche Macan GTS is child’s play. From backpacks to pushchairs, there’s room for everything – with no tight squeezes and no games of Tetris. As a passenger, what I also love is the excellent ergonomics and the modern infotainment system with online navigation, Apple Car Play and other features – and Porsche has of course found room for its classic stopwatch too. Some traditions are well worth keeping. So what’s our verdict? 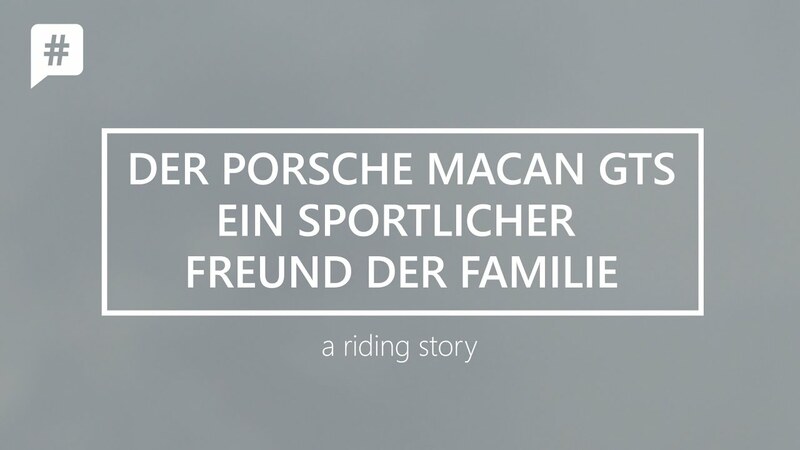 In just a few days, the sporty Porsche Macan GTS has proven to be a real friend of the family. Although it’s a vehicle that is suitable for families, the driving experience in the Macan GTS is still very “Porsche-like”. This was really important to us, because a car that is both uncompromisingly sporty and family-friendly is a rare thing, right? And for our family, it offers yet another plus. Sitting “up here” makes us feel safer than in a sleek sports car. And isn’t that the most important thing to any family? So let’s end this report on our experience of the Porsche Macan GTS with those superlatives. We look forward to seeing our new family friend again soon. Mia Bühler is a real workaholic. If she had her choice, the Stuttgart native would be found leaning against a palm tree with her feet in the sand, her eyes fixed on the vast ocean ahead – and her tablet not far away. As a social media consultant with her agency “creading GmbH” and a blogger on a range of topics, this young mother is always on the go. When it comes to food, she stays true to her southern German roots and loves hand-made “spätzle” with sauce from daddy’s kitchen. 60 years after a 356 was photographed with skis strapped to the roof, the 911 wanted some of the limelight. The new GTS version of the Macan is inspired by motor racing.